things happening in outdoor Sports. Cold Season - "All Your Winter Sports Needs, But The Snow"
Ski and Snowboard accessories in Boston MA. 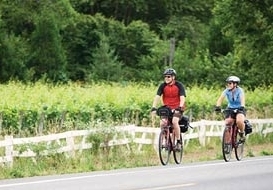 Warm Season - "All Your Summer Sports Needs, But The Sun"
(Bicycle), and 8-wheel vehicles (Inline Skates). Our Skates Shop boasts New Englands widest selections of Rollerblade and K2 inline skates. Our wide selection includes skates from Rollerblade and K2. We stock the full range of adult and junior sizes. For the little ones, we have skates down to the tiny size 9 (Smaller than size 1). Our junior skates offer adjustability to allow continued use as young feet grow. We also have recreational skates, advanced skates, and aggressive skates. Since we're Expert Ski Boot Fitters, we bring that extensive experience to finding and making a happy home for your skating feet. We've got the techniques and fit aids to ensure you get a comfortable and functionally-fitting skate. Our experienced staff can help you find the skates, pads, and accessories that will enhance YOUR individual skating experience. Since we're skaters ourselves, we'll apply our knowledge to answer all of your questions to help lead you to a satisfying choice. At Centre Ski & Bike, we pride ourselves on top-flight service. Because of this, we spend an additional few minutes at the end of your purchase to go over the "Use and Care" of your skates. Our tips will give you a more satisfying experience, as well as longer service from your skates. Please also note that we stock a wide range of replacement parts including wheels, bearings, replacement brakes, and other hardware. A Diamondback, Fuji, Norco, and KHS bicycle suits everyone's bike budget. Bicycles Galore! With our large selection of new and used Bikes, you'll find the Bike that's right for you. We have used bikes and rent bikes. C'mon in to see why we're listed in "Mr. Cheap's Boston" as the Best Bike Discounter in Boston MA. We stock bike parts so our bike mechanics can expertly repair or tune-up your bike. Your bicycle will love it. You'll love our huge stock of bike accessories, bike helmets, and bike car racks. At Centre Ski & Bike we offer you selections of the best Bikes, Skates, Skis, Boards, Boots and Accessories out there. Our expert staff will help you find the products that will leave you smiling for a long time. Top flight fitting and service skills ensure you enjoy fitting, tuning and repair work that have consistently produced the highest levels of customer satisfaction; we will do everything we can to meet your expectations. We’ve been in the Bike, Skate, Ski, and Snowboard business in greater Boston MA since 1980. Our best advertising is our repeat customers who tell their friends about our great service, selection, and prices. With everything we offer we’re sure you’ll be happy working with us. Review our website and please contact us. if you have any comments or questions, We hope to see you soon! Whether you use Skis or Snowboard, we’ll get you down the mountain in style with our selection of Skis, Ski Boots, Ski Clothing, Snowboards, Snowboard Boots, and a wide selection of Ski and Snowboard accessories. We have Ski and Snowboard clothing by Ride, Marker, Obermeyer, Turbine Boardwear, Karbon, Killtec, and Hot Chillys. You'll love our Skis and Ski boots by Rossignol, Nordica, K2 Skis, Elan, Alpina, Salomon, Atomic, and Dalbello. 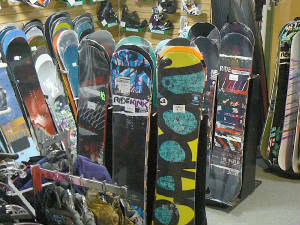 Come see our Snowboards and Snowboard Boots from Ride, K2, Zuma, 5150, Snowjam, and Spice. We've got full stock of Snowboard accessories. Who says choice isn't good? Click photo to go to SNOWBOARDS page. Our highly knowledgeable, trained Ski and Snowboards staff has an avalanche of experience. We will help you select the perfect skis, snowboards, and ski and snowboard gear for your level of skiing and snowboard experience. We’ve been in the Skis, Snowboard, and Bikes business in Boston MA since 1980. Our best advertising is our repeatcustomers who tell their friends about our great service, selection, and prices on all of your Ski, Snowboard, and Bike needs. 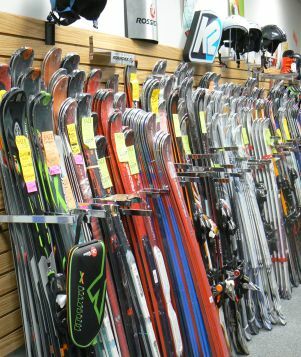 We offer new and used Skis and Snowboards, and trade-ins on Skis, Snowboard, or Snowboard Boots. We have Ski and Snowboard day rentals and full season leases. And, our full-service Shop can repair or tune your new or used Skis or Snowboard to a “T”. C'mon in and see why we're listed in "Mr. Cheap's Boston" as the Best Skis and Snowboards Discounter in Boston for Downhill Skis, Cross-Country Skis, Ski Boots, Snowboards, Snowboard Boots, and Ski and Snowboard Clothing.